(Newser) – A call by Republican Ohio Gov. 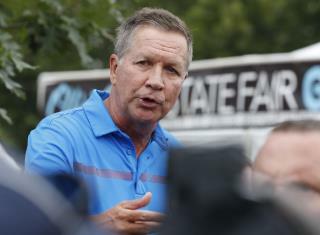 John Kasich for scientific breakthroughs to help solve the opioid crisis is drawing interest from dozens of groups, with ideas including remote-controlled medication dispensers, monitoring devices for addicts, mobile apps, and pain-relieving massage gloves. The state has received project ideas from 44 hospitals, universities, and various medical device, software, and pharmaceutical developers that plan to apply for up to $12 million in competitive research-and-development grants, the AP reports. Ohio leads the nation in opioid-related overdose deaths, counting 1,155 deaths by fentanyl alone in 2015, the latest year figures were available. The Ohio Third Frontier Commission is handling the grant program and expects full proposals by an Aug. 31 deadline. Kasich the magic man feel good masturbation. Dont expect much. "Ohio leads the nation in opioid-related overdose deaths" This is part of the reason I don't but this whole opioid epidemic crisis. Didn't they just say earlier that Wet Virginia led the nation for that? It's all propaganda. And not even coordinated propaganda. One word, Marijuana. I kicked a 6 year addiction to Percocet, in about 2 months. I had a $100 a day(this varied depending on what I was able to find). I had a month where my supply shut down. My friend brought me 10 mg THC capsules ...... now two years later, I would rather die, than go back. The capsules took the sweats, jitters and muscle spasms away. Which gaave me the ability to really focus on the mental. The tactics to change my thinking when craving was triggered. People need to realize marijuana is not the problem. It is the solution.Or a piece of the solution.